The species is widely distributed in England, mainly near the coast in Wales and with few records for Scotland. It is a Holarctic species, widespread in western and central Europe, but becoming rare in the north. It is absent from Norway, an occasional import in Finland and listed in the Red List for Sweden (Gärdenfors 2000). The species has been introduced to Canada, the United States and Mexico. The species is found in gardens, cellars and outhouses under rubble or other debris but is also recorded in more natural habitats under logs in woodland or hedgerows and under stones. 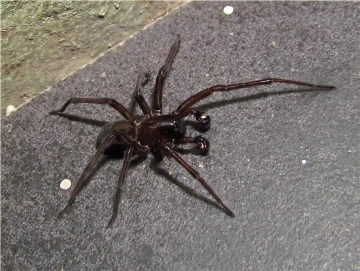 According to Bristowe (1958) the species is more likely than the other two Amaurobius species to be found in shady and damper situations in walls or at the entrances to caves or tunnels. It is probably under-recorded despite its large size and impressive appearance. Adults occur throughout the year but mainly in the spring and early summer. The spider is much less common than A. fenestralis and A. similis and becomes rare in the north of Britain. Bristowe, W. S. 1958. World of spiders. London: Collins New Naturalist. Gärdenfors, U. (ed.) 2000. Rödlistade arter i Sverige 2000 - The 2000 Red List of Swedish Species. Uppsala: ArtDatabanken, SLU. 397 pp. Account last edited by Geoff Oxford at 15:49 on Thu 14th Jun 2018.